It fills me up with pride and happiness to come across #TakeCharge stories of women we know. They are not monumental in nature, but play a crucial role in writing the narrative of a better and equal society. SHEROES Work From Home professional and member, Navya Kiran’s simple yet positive story is one such example. With a BTech in electronics and communication, she took a maternity break post her child’s birth. But she wanted to get back to working full time. But there was a catch to it she was not comfortable with the idea of leaving behind her daughter alone. This is her story of #MakingItWork. “I wanted to take a break till my child started going to school. I quit from WNS Global Services Pvt Ltd, and from that moment on, was praying for a genuine Work From Home (WFH) job opportunity, so that I can concentrate on my kid and grow professionally as well. I came to know about SHEROES through a friend of mine. I had no clear idea about the WFH program. I went ahead and enrolled myself and then totally forgot about it. In fact I was making some other arrangements half-mindedly and attending few interviews too. 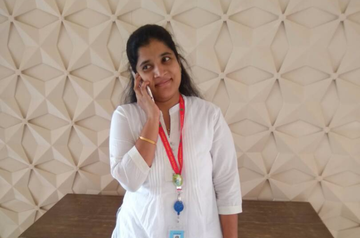 I did accept offer letters from 2 prestigious companies with a very good package when my phone rang on one evening, this was the call from SHEROES explaining about the Work from home module. My daughter was the main reason which even made me think about the WFH module. After getting selected, which I was confident about, my journey thus began as a Work from home professional. I was pretty much excited on my first day, because it was after 4 years I was getting back to the work routine. My parents were there at home to take care of the child and my journey started with Amazon. I have not looked back since then. Working from home was a hassle initially because everyone at home was getting used to it. We had to give our complete attention and 9 hours of time on an average. It required adjustments on my part for the first month. Don’t try to be a superwoman by taking all the tasks on your head. At the end you have to do justice to your work. Set your expectations you have, out on the table, from your family. Just because you are working from home that doesn’t mean you are available during the office hours too. You can’t be available at their beck and call. Most importantly, delegate household chores among your family members. Ask them to get their food heated and serve to themselves to eat. My shift starts from 5 PM and clock out at 2 AM. It’s a 9-hour shift. As I had mentioned in the beginning due to connectivity problem, we log in at 4:30 in the evening and by the time we hit the sack it is already 2:30 in the morning. After which I wake up around 8 to get my daughter ready for school. The delegation starts here with my lovable husband waking up my kid and arranging her school bag and dress. After setting up everything, he wakes me up to bathe her and get her ready for her school. After this 4 and half hour sleep I try finishing up cooking for the day by around 11. After my child comes back we have our lunch together and sleep again for 2 hours. I’ve set a routine for my kid. By the time she wakes up and my husband is back from the office it is he who then handles her. Role played by the company to make it work for us. We have our office visits once in a month and fun virtual sessions once in a week. I am in fact writing this after one such fun session. Our senior manager comes from Hyderabad just to meet us for few hours and to know how things are functioning. Monthly rewards and recognition program are conducted to hand out gift card from Amazon and a certificate to the most productive employee. This helps in boosting our morale. I am blessed with 3 such awards till now. Very recently we had a team lunch and the General manager was present to attend this luncheon with the WFH module employees. These things really go a long way in building up the importance of such work option. It has been around 4 years and I was a full time home queen and was available always for my family. Now that I have started working there are bound to be changes, however small, but my family is getting used to it. They are supporting me by revamping their schedules according to my timings. If my daughter finds I am rushing a task, she offers a helping hand to get it done. Amazon plays a great role in my life now-- I love the work I do, I enjoy what I do. It’s been 6 months with the family of Amazon and my hard work has been recognised well. I am currently supporting a small batch which had joined after us and now I am looking for growth. My mother has been a real backbone for me in these 6 months -Although she is leaving for United states now, she held the fort down for us. Now on, I will plan all my schedules much more carefully. When you love what you’re doing everything is positive, the way ahead is crystal clear for me. Can I know too, the story was very inspiring . What wfh options are available with Amazon and how i can apply? Plz guide. Even I want to WFH . My kid is 5yrs old. Amazing work. I live in a third tier town. And I am looking for a WFH jobs please can you give me some tips which will help me to get a job. Truly inspiring one and its a huge boost for many women looking forward to return to work. I am now working in an Engineering College. But looking for a work from home kinda job just because to raise my child. Can u please suggest me that from where I will start putting my CV? ?I will wait for your reply Navya..
Great work Navya.Really inspiring.It would be really great if you can shartype of work profile in Amazon.Is that software development or HR etc.Would definitely want to get in touch with you. Your story is a huge boost to many women looking forward to return to work. This is soo inspiring. Soo happy for you Navya. May your ambitions fly high. You are enjoying one of a dream many homemakers like me long for. Genuine work from home oportunities are a hunt for many of us. This article gives a brief idea of the extra effort a homemaker puts into balance both home and work. Kudos to the writer too.Hope to join Sheroes team and earn from the comforts of home.